The stage is set and the thrills are about to begin as“Asia’s Got Talent” bows across the region in a week’s time on AXN! Debuting first on AXN on Thursday, 12 March at 8.05pm with subsequent episodes airing in its regular Thursday 8.30pm slot,the brand new series is the biggest talent competition in the world featuring some of the region’s most breath-taking, jaw-dropping and mind-blowing performing artists competing for the coveted winning title. “Asia’s Got Talent” is the 63rd adaptation of the Guinness World Record-breaking hit “Got Talent” format, which was created by Simon Cowell’s Syco Entertainment and is co-produced by FremantleMedia. The “Got Talent” format is officially the most successful reality TV format in history and currently airs in 186 countries. Each act competing in“Asia’s Got Talent” will have to win overat least three“Yeses”fromthe esteemed celebrity judging panel comprising 16 time Grammy-winning Canadian musician David Foster, UK pop sensation and former Spice Girl Melanie C., Indonesian rock icon Anggun, and Taiwanese-American pop idol and actor Van Ness Wu. Watch out for the glittering “Golden Buzzer moments”, where each judge has one opportunity to send a brilliant act straight to the semi-finals at Marina Bay Sands. The four judges must select the most incredible and amazing performances from thousands of hopefuls from 15 territories across Asia. Those who make it to the semi-finals will contend with an even tougher judge, the home audience who will decide the winner of “Asia’s Got Talent”. Prizes worth $100,000 USD are at stake, along with the opportunity to return and perform at the iconic Marina Bay Sands, Asia’s leading entertainment destination – where the semi-finals and finale are to be held. Supporting the judges are Marc Nelson and Rovilson Fernandez as hosts of “Asia’s Got Talent”. AXN audiences will remember the pair of friends as contestants of “The Amazing Race Asia Season 2” and hosts of the talk show “The Duke”. “Asia’s Got Talent” spans 10 weekly episodes,including five audition episodes, three semi-finals, a finale episode and a results gala. In addition to enjoying the fantastic performances, audiences will get to know their favourite acts as “Asia Got Talent” tells the life stories behind some of the most colourful individuals and groups in the competition. 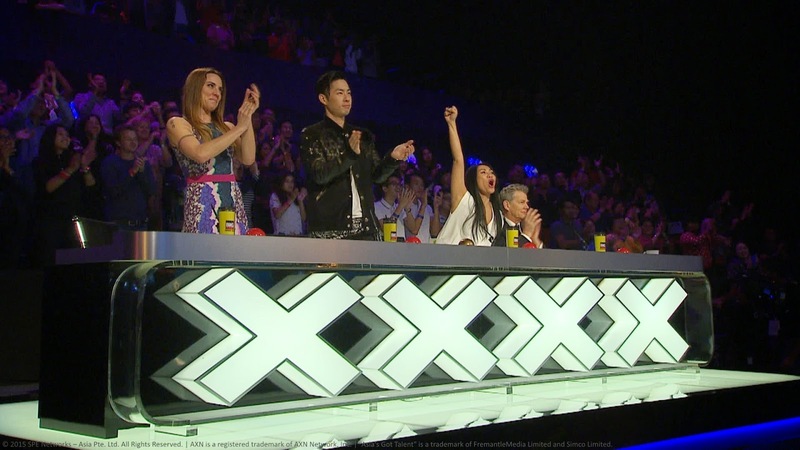 “Asia’s Got Talent” is proudly presented by Marina Bay Sands, Big Cola, Pantene, Caltex,Jetstar, and GrabTaxi. Brought to you in the Philippines by: KFC, Globe, and Cherifer. “Asia’s Got Talent” debuts on 12 March 2015 at 8.05pm. Subsequent episodes air on Thursdays at 8.30pm.